“I’m here for your en-ter-TAIN-ment!” Adam Lambert declares on the title track of his freshman CD. It’s a safe bet that recently, America’s most visible openly gay singer also became one of America’s most talked-about celebs even among those who never watched a minute of “American Idol”. The song that inspired Adam’s now-notorious TV performance is the second song on the singer’s highly anticipated debut album– complete with elastic, addicting rhythms and thick glossy coating intact. 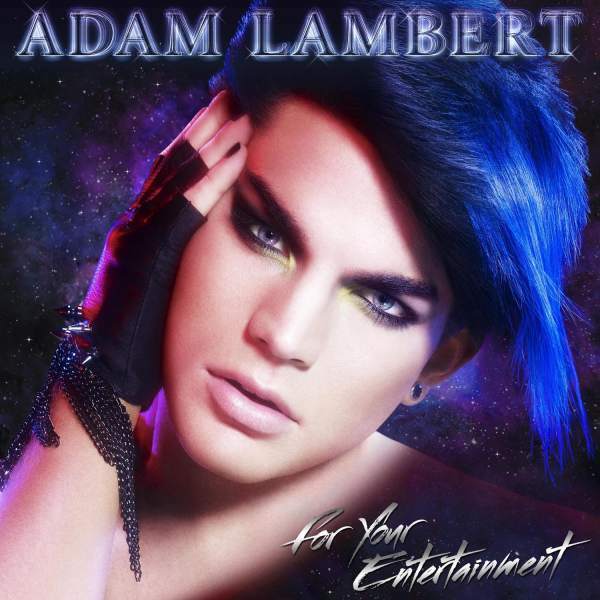 But can the rest of the music on “For Your Entertainment”, the album, match the singer’s new notoriety? Or is the new CD just another prefab piece of pop fabrication, as slick as the much-discussed album art? The opening track, “Music Again”, gives us rock guitars, an electronic-heavy club vibe, and a “Yeah! Yeah!” early ’90’s boy band spirit running through. Underneath all the (over)production, though, it’s a flashback to when rock-pop dared to dominate the radio (The song even seems to throw in a hook from Ratt’s 1984 hit “Round and Round”)… and the divo can certainly scream and gnarl as well as his 27-year old vocal cords can be expected. The third song, “Whadya Want From Me”, has more of an arena-rock vibe. For those of you who may be worried that Lambert’s praised voice will be drowned out by all the album’s musical indulgences: Don’t worry, girls… you’ll get to hear enough of the singer’s raw vox soon enough. The piano-dominated “Soaked” is Lambert’s token big, wet power ballad. For this one and for “A Loaded Smile” later on, the Gay Idol gives us that angsty kind of twenty-something white boy-style soul you’d expect. To his credit, he can belt (Listen to “Fever” for proof.) and hit some impressive notes when the music gives him a chance. The guilty pleasure “Sure Fire Winners”, I predict, will become one of Lambert’s emblematic singles, although it sounds like it should have been on the radio in a different decade altogether. This mid-tempo pop tart (with rock ‘n’roll icing) of a song compels you to throw your fists and singing along to Adam as he declares, “WE are! WE are! WE are … Sure fire winners!” The 13-year olds should love this one. But Lambert’s true shining moment comes with “If I Had You”. It’s the best song on the CD, largely because it rolls around in its own ecstacy, lyrically (“So I got my boots on, got the right ‘mount of leather; and I’m doin’ me up with a black color liner, and I’m workin’ my strut; But I know it don’t matter, All we need in this world is some love!”) and beat-wise: a bona fide feel-good track which should be appreciated by gays and straights, boys and girls, tweens and thirty-somethings alike. Old school rock star aspirations aside, this one clearly has its heart on the dancefloor. “Fever” was co-written by Adam’s fellow gay icon Lady Gaga. Astute listeners will no doubt hear many of the Lady’s now-trademark “Gaga-isms” in this track, not the least of which is the song’s “So what? !” style of casual sexiness– which, in this reviewer’s opinion, suits Mr. Lambert much better than his overripe raunchiness on the American Music Awards. Interestingly, the best example of Adam just being Adam comes with the next-to-last song, “Broken Open”: with minimal musical adornment, it’s the best display of the neophyte star’s voice. Taking a line from the first track, does Lambert’s CD “make me wanna listen to music again”? The answer is: Yes! He keeps his promise to entertain us. Like his idols KISS, Lambert seems to know that pageantry and theatricality are an important part of music. And, as if we needed to be reminded: Artists who break the rules are always a great thing.